One of the things I've noticed about me is that when I get into a food show, the getting out is just as intense. After a while, it feels like I can predict their style, what kinds of food they will be making and the predictable starts to feel boring. But there are gems you take away from the romance phase with a show, those are a keeper. It was the same with Giada's show on Food Network. I watched it for a couple of months and then stopped, but found this artichoke soup recipe just amazing. Artichoke is not a vegetable I use often and even when I do, it's rather limited. 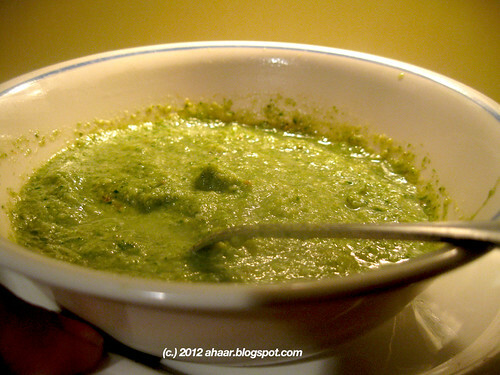 So when I saw this soup recipe with artichoke combined with spinach, I just had to try it. 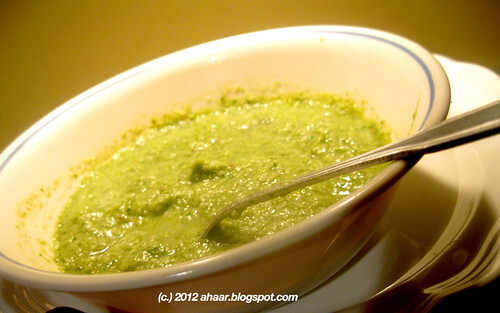 I ended up adding spices to the soup to suit my taste and also cooking the spinach with the artichoke. The spices were some sriracha sauce, some cumin and that brought out the tartness too. Heat the oil in a large saucepan and then add the onion and let it saute for a couple of minutes. Then add the celery and let it cook with some salt and pepper. Cook the vegetables till they turn soft, then add the artichoke hearts. Add salt and cumin seed powder. Let it cook for a couple of minutes then add the spianch as well. Add the broth and let it cook on medium-low and simmer until the artichoke hearts are tender, about 12 minutes. Puree the soup with the mint and sriracha sauce. You don't want the soup to sit with the hot sauce for too long. Add some additional broth or water if you want the soup thinner. Squeeze a lemon wedge over each bowl of soup before serving. Even though the winter hasn't been bad, it still feels good to say spring is here. The temperature is in the 60s and 70s this week, Lil A is back at the park swinging to his heart's content and the tulips and daffodils are springing from the soil. And the palate is changing as well. I want something light and flavorful, but gazpacho wasn't an inspiration from that. It was from seeing a loaf of artisan bread we had bough a few days ago becoming hard. I had two choices either make a bread pudding or try something else. And then I came across gazpacho while watching Anne Burrell on Food Network and decided to try that. I didn't use tomato juice to puree the ingredients which gives gazpacho it's bright red color. 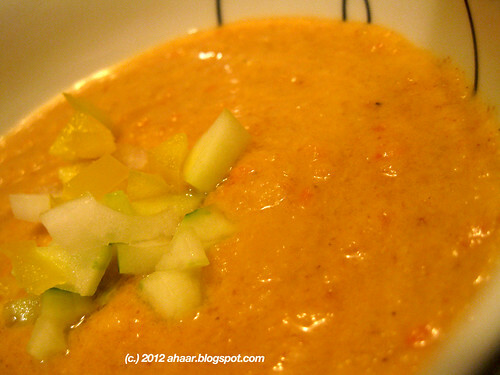 Instead I used water, so my gazpacho looks more orangeish-yellow. But it is super simple and the taste is just divine. 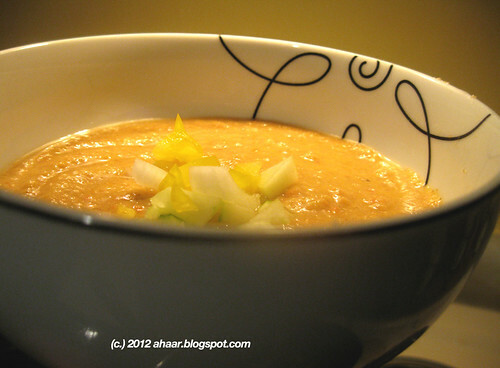 The mix of salty, tangy and sweet is perfect and teams well with the freshness of the soup. Give it a try at least once. Soak the bread in water for about 15 minutes and then tear it in smaller pieces. 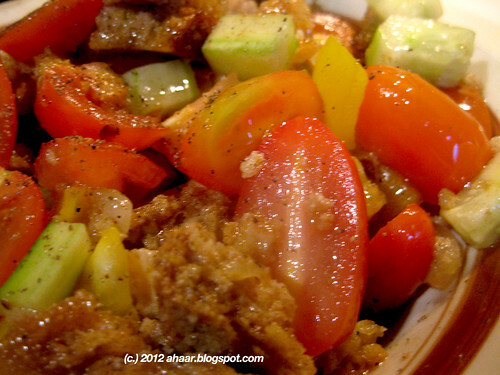 Mix it with tomatoes, cucumber, onions, bell pepper, vinegar, half of the olive oil, salt and pepper and garlic and let it all mix together and soak flavors. Set it aside for 40-45 minutes. Then puree it all together. Mine didn't fit in one go so I had to do it in batches. Keep it aside in the fridge for another hour. Dice some pepper, onion and cucumber for garnish on top and serve chilled. I had 30 min before I served it so it wasn't very cold but just as delicious.